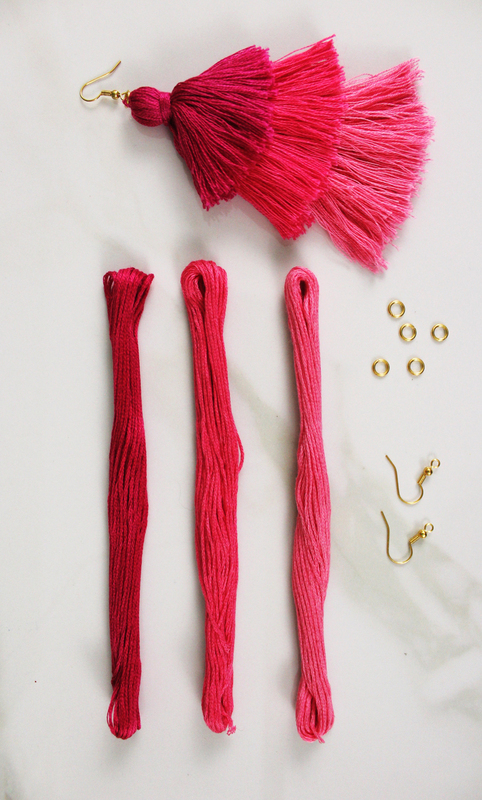 Today we are making DIY tassel earrings. I love a good tassel project and these all come with step by step instructions & a video. It’s so easy, anyone can follow along! The earrings are a fun summer project you’ll wear the rest of the year. I am a firm believer that the perfect accessory can take any good outfit and make it into a great one! 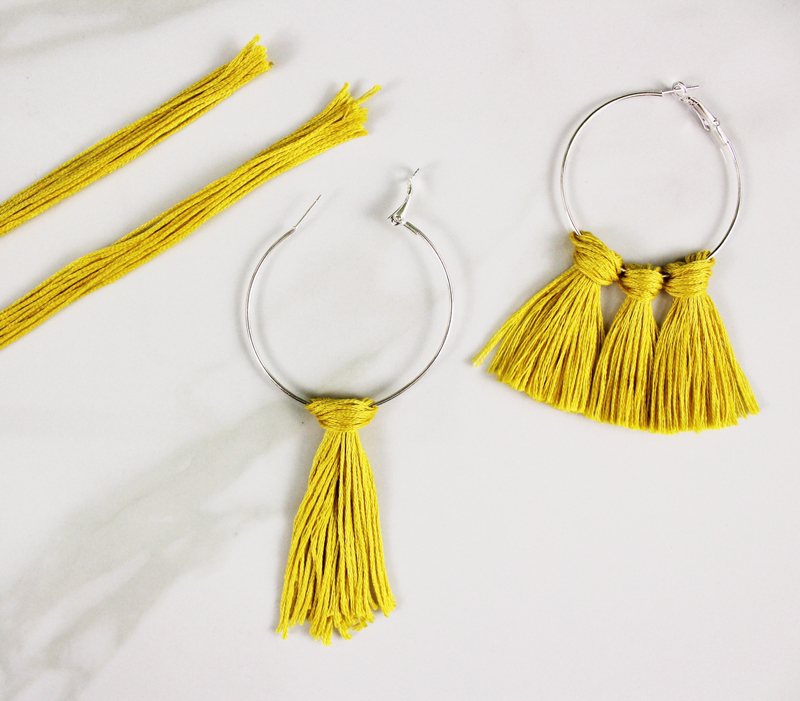 Whether your going out on the town, headed to the beach, or out shopping with your best gal pals these adorable DIY Tassel Earrings are sure to turn heads! They are easy, colorful, and an inexpensive addition to any summer outfit. All you need are a couple basic jewelry making tools and supplies to create them. I’ve been a long time fan of the power of a colorful tassel in making anything better. 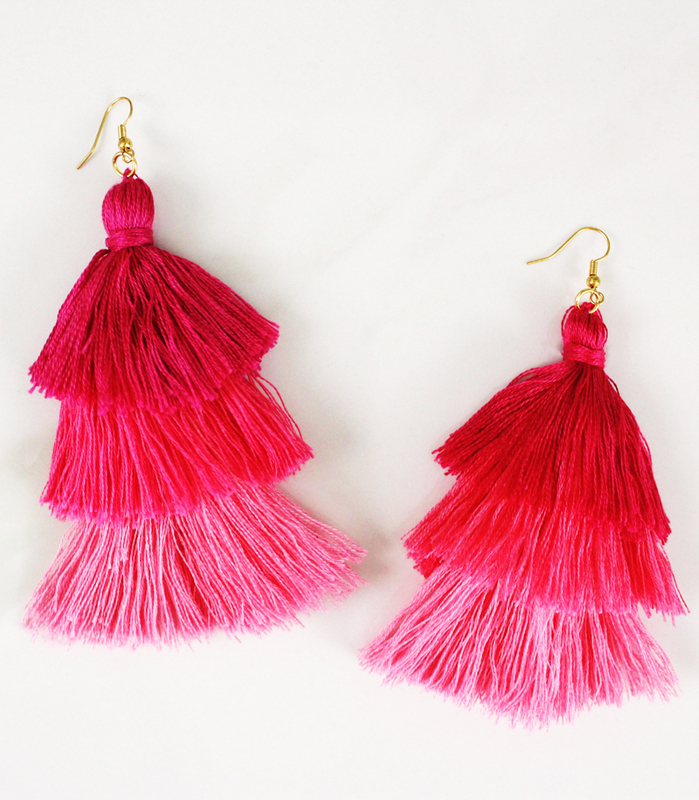 Here are a few other tassel projects that are easily made once you get the hang of these DIY tassel earring projects. Even tassels on a turkey! 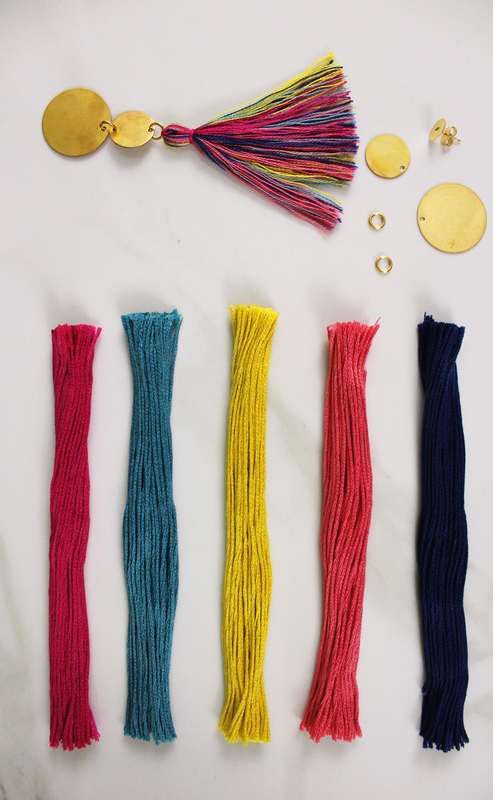 We are making tassel earrings three fun ways today! Spend a lazy summer day making a set of these and be ready for fall fashion to start up again. 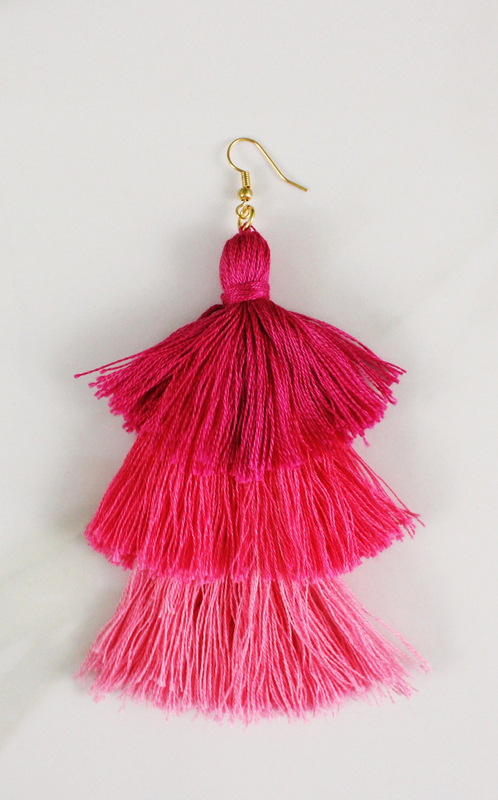 I also love a large tassel earring with a bathing suit… such a fun look to rock this season. 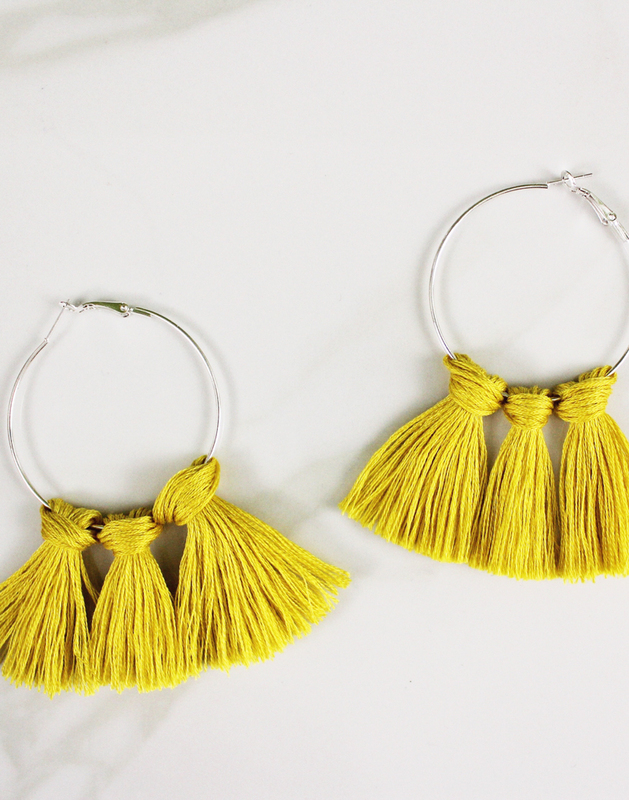 *We have an easy to follow video for each of these DIY tassel earrings. Follow along with the videos or follow the directions listed here. 1. Cut hoop of skein to create loose pieces. 3. Secure tightly and trim tassel to desired length. 4. Repeat steps, adding as many tassels as you want. Helpful Tip: Use a comb to brush out the tassel to create a fluffier tassel. I love a good vertical stacked earring. These ombre tassel ones are like a party in themselves! What’s the best embroidery to use? My favorite embroidery floss is found right here, the colors in this set can’t be beat! 1. Take your skein of embroidery thread and separate into a circle. 2. Twist skein to double your circle. 3. Use an extra piece of embroidery floss to create your tassel. 4. Grab two jump rings and string them onto your extra floss piece. 5. Tie a tight knot with your extra floss piece and jump rings around the inside of your circle of floss, making sure one jump ring is on top and one is on the bottom of your knot. 6. 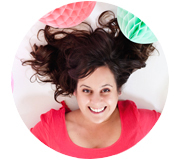 Use scissors to cut off the bottom of your circle, creating the perfect tassel. 7. Repeat steps 1-6 with your other colors. 8. To create the earrings attach the jump rings on each tassel to one another. Connecting the bottom ring to the top ring of the other. 9. Finally, use your top jump ring and attach to earring hook. Helpful Tip: Use a comb to blend in layers and create fluffier tassels. 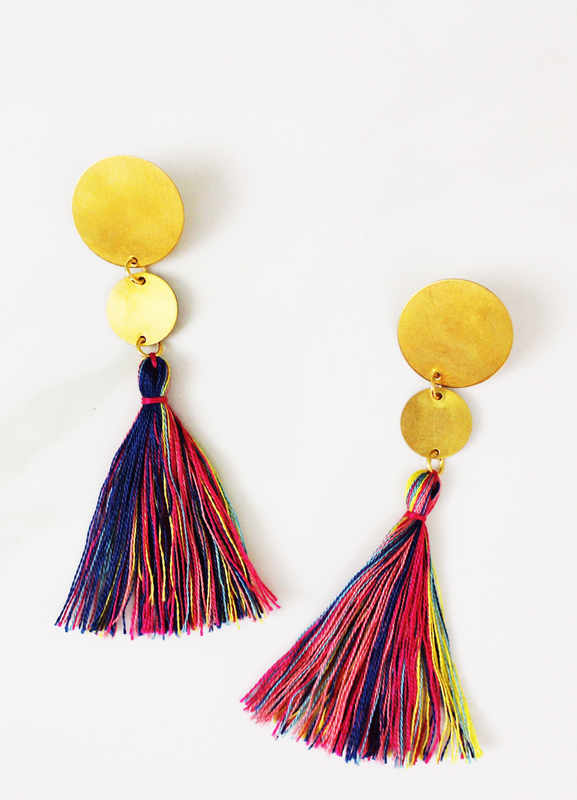 These Multi-Colored Tassel Earrings look amazing with a simple summer dress. The graphic circles bring a quick pop to any look. 1. Take a few pieces of each floss color and combine them into one group. Helpful Tip: Use a comb to completely combine colors. 2. Use an extra piece of floss and string on 1 jump ring and tie around the center of your floss. Leaving your jump ring at the top. 3. Attach the tassel and round blanks together using your jump rings. 4. Secure the earring back with your E6000. Helpful Tip: Use a comb to fluff your tassel. There you have it! A season full of DIY tassel earrings that will have you looking your best no matter where you are! (Photography & Video ©A Subtle Revelry by Whitney Gray). I think this is the great creation and personally, I will try this DIY tassel earring at home and this is looking easy to make. thanks for sharing this informative creation.